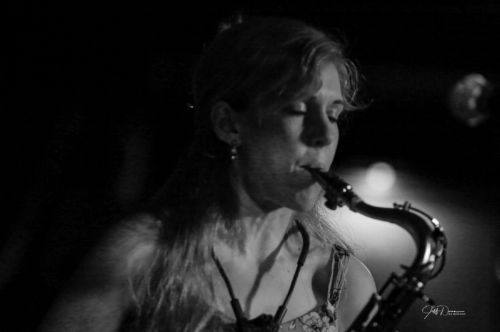 Molly Jones’ compositions range from through-composed chamber works to graphic scores to electroacoustic environments for improvisation, incorporating video, movement, and words. She has performed with musicians including Saul Williams, Nicole Mitchell, Tyshawn Sorey, Robert Ashley, Jaribu Shahid, Ed Sarath, Kei Akagi, Alex Harding, Paul de Jong, Wadada Leo Smith, Andrew Bishop, Douglas Ewart, Joo Won Park, Elliott Sharp, Cheick Hamala Diabate, Marion Hayden, Matt Kiroff, and many friends in the US and Canada. She has been commissioned by Verdant Vibes Ensemble, the Detroit Composers’ Project, and Detroit Fringe theater festival; her video installations have been presented at Rooms To Let, FireFish, and Detroit Contemporary; and her poetry can be found in Saul Williams’ Chorus: A Literary Mixtape, Matchbox Magazine, and her zine Moon Jar. She is working on an opera-ballet to be premiered in fall 2019, a solo performance piece (July 2019), and an orchestral work (December 2019).